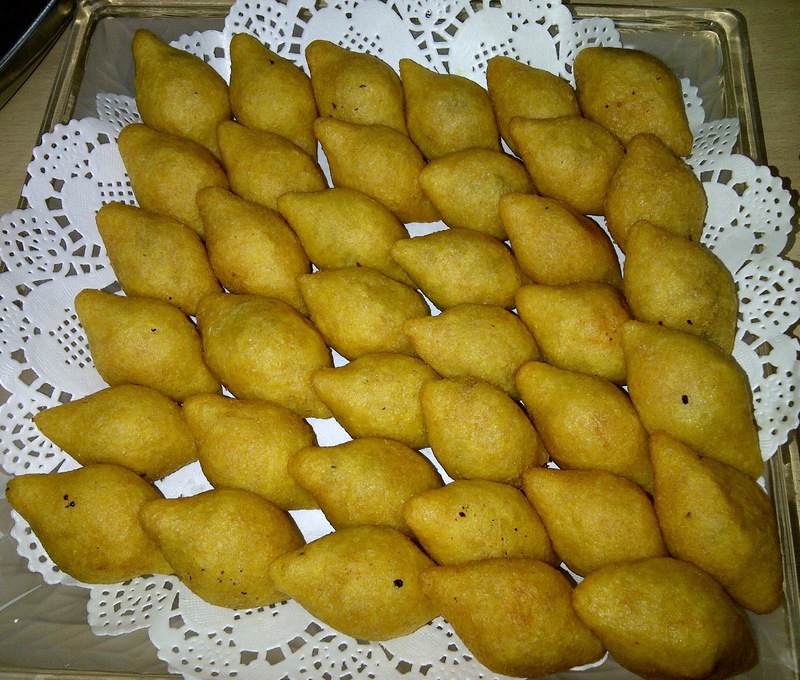 Kubba halab, or kubbat halab, is an Iraqi delight named in homage to the Syrian city of Halab. Halab is famous for its several types of kubbas. Kubba generally uses burghul or jereesh as part of the crust, but this one, a personal favorite by far, uses rice. The usual filling of minced meat applies here, though a touch of ground noomi is added to enhance the flavor. I've been making these little gems for years, but adusted slightly my recipe according to suggestions provided by Manal. Presented here is the perfected version. The filling: minced meat, onions, parsley. The crust: potato, rice, spices. Grinding to form the crust. Lining in single layer to freeze. To make the filling: saute the mince in a pan until browned, add the onion, salt, pepper, cinemon, alspice, and noomi. Keep cooking until onions are transparent and there is little to no liquid left. Remove from heat, allow to cool slightly, stir in the parsley, allow to cool completely. To make the crust, boil all the crust ingredients together for 10 to 15 minutes until the potatoes are half cooked and the rice grains have doubled in size. Drain and spread on a tray to cool and dry off. Push the crust ingredients through a meat grinder machine (using the fine hole disc). Knead the resulting dough a bit. To form the kubba, it is easier to have a bowl of water to wet your hands with so it will not stick. Take a walnut-sized ball of dough, and cradeling it in the palm of one hand, use you index finger of the other hand to fom a hollow in the middle of the ball (see picture). Fill with a teaspoon of the filling, and seal, eventually forming a torpedo shape, with slightly pointy ends. I suggest freezing the kubba, in a single layer and well spaced before deep frying them. If they are not fried frozen, they might break up inside the frying oil and cause a large mess. While frying, avoid touching with any tool as it might break the fragile crust. Instead, gently swirl the pot to allow the kubba to turn themselves over. Thank you so much for this recipe, it's also my favourite kubba by far. I can't wait to try it out. Does this recipe yield the amount shown on the tray? Also, I don't have a meat grinder, what's an alternative way to mix the crust if there is one? The ingredients listed would normally yield abour 35 kubba. I tend to double or sometimes treble the recipe to freeze. I think a regular food processor might work as a substitute to the grinder, just make sure that it will handle a bulk (for your safety), and you might consider processing in batches. Thanks again for your visit, feel free to comment or ask anytime. Yes, God knows I've tried many many recipes before finding the perfect one! I've tired with plain rice, and with eggs, so when I finally tried it with potatoes it was like a revelation!! Just be careful to not add too much potato, otherwise it will resemble potato chap rather than kubba halab. Bil afia habibti and shukran hwaya for your comment. Is the crust crisp when it is fried? I purchased some and loved them, the crust was thin and crisp. I would like to make my own. The crust is most certainly crisp when fried appropriately, and remains so for about an hour within frying. So this is a dish to be fried just before serving. Maryam these look amazing. How long do you fry them for? Hi Maryam. This is neat and well illustrated. I will try the recipe. Hope it does not take me all weekend to make 35 kubbas! Don't worry, practice makes perfect, and recruit help to make it easier! Was Salam Mariam, good luck and let me know how it works out! When I fry them frozen solid they come out better then the freshly made ones OR thawed kubba (which are disasterous). Conduct an experiment and see for yourself.